My father picked a spray of white roses growing near the entrance gate to the steel mill where he worked in Ohio and brought it back to my mother to show her. He was amazed at how beautiful it was–and how clean and how big. He thought perhaps they might get it to grow in their yard. He managed to root it and planted it in the front of the house. That must have been in the early 1960s. Anyway, it was his habit to bring things home such as a spray of fruiting bittersweet or a tiny plum. 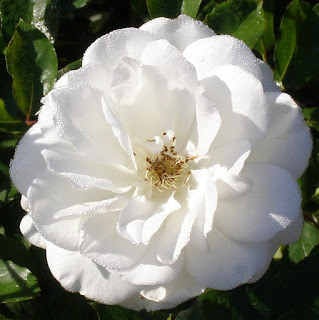 He planted his white rose next to an old pink scrambler, probably Dr. W. Van Fleet (1910), which he had found growing near an abandoned farmhouse while he was out hunting rabbits. Over the years, several extended periods of below zero weather and much die-back, these two roses continued to grace the front yard. My mother hated Dr. W. Van Fleet. It bloomed only in the spring and every time she went near it, a cane would scratch her and make her bleed. The white rose fared better, but since they’d become entangled they both frequently got chopped back. During a rare visit to California in 1995, my father again true to his habit, smuggled in his luggage two rose cuttings from his yard. One was red, he said and the other white. I got them to root, nursed them along, and planted them in my backyard. The red turned out to be Dr. Huey – the infamous rootstock –and the white, the same one he’d brought home from work many years previous, proved itself to be an absolutely virus-free specimen of Iceberg. Iceberg is a floribunda created by Reimer Kordes, son of the legendary rose hybridizer Wilhelm Kordes (1891-1976) in Sparrieshoop, Holstein, Germany. It was introduced in 1958 and is known in Germany as Schneewittchen (Snow White) and in France as Fée des Nieges (Snow Fairy). 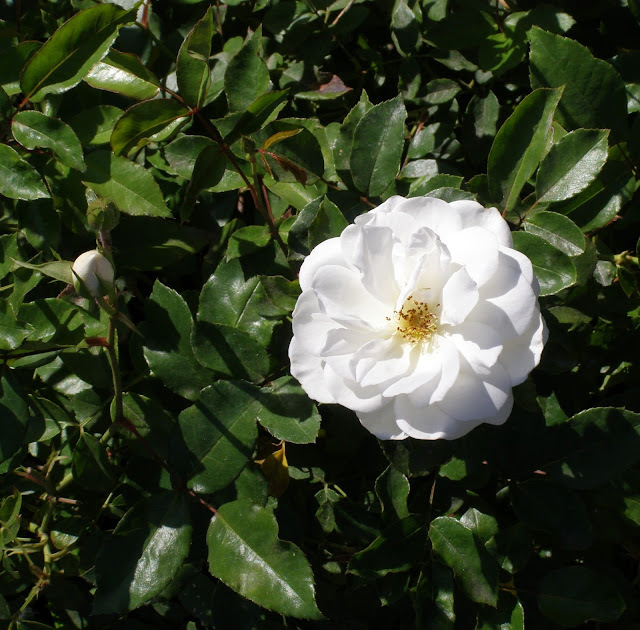 Its large clusters of bright white, medium-sized flowers will nearly cover the entire bush. It has large flushes of blooms but is rarely without any. Its growing habit created an entirely new use for roses in the landscape. Iceberg, when planted fairly close together in a row or circling a flagpole, will form a beautifully neat and uniform hedge. The bright green, disease resistance foliage creates a magnificent backdrop for the ample sprays of pure white flowers. It is repeat-blooming and, most importantly in a multi-rose planting, self-cleaning. That is the petals from the three- to four-inch flowers, once spent, fall to the ground and do not remain dried up, dirty beige wads clinging to a branch. What it may lack in individual charm, historical grandeur, and distinctive grace, it readily wins back in “the most bang for the buck” category. If you don’t have time to grow roses, plant Iceberg. It looks fine in a vase, too, and lasts for several days. It is wonderful in a garden. I detect a fresh scent, but it really has no great fragrance. The parentage of Iceberg makes it, even more, an anomaly and proves again how full of genes these biological wonders are. Its seed parent is Robin Hood (1927), a cherry red, hybrid musk bred in England by that class of roses’ chief promulgator, the Reverend Joseph Pemberton. The hybrid musk background accounts for its vigor in partial sun and for its clusters of flowers. Its pollen parent is the hybrid tea Virgo (1947) bred in France by Mallerin and introduced by Meilland. Virgo’s gracefulness of individual flower and its moderate growth habit are apparent in Iceberg. In 1983, Iceberg was inducted into the World Rose Hall of Fame joining Peace, Queen Elizabeth, and Fragrant Cloud. The progeny of Iceberg is also quite surprising. A climbing version became available in 1968. It is a fine pillar-size rose though I found it a courser plant than the original and more likely to be carrying a rose mosaic virus. The telltale mottled leaves disfigured my two large specimens in the front yard so badly that I dug them out and discarded them with great effort. The climbing sport is not the bush at its most elegant. Iceberg is the seed parent of the one rose that has nearly upstaged it on the landscape circuit – Simplicity (1978) which was developed by Bill Warriner at Jackson and Perkins. Simplicity got all of Iceberg’s admirable garden qualities. But its pink color distinguishes it from its parent as does its diminished flower-size and, in my opinion, further shrunken personality. These two roses were bred to be admired from a distance and in mass plantings. They are flowering bushes which look good with minimum care. In placing a whole new class of roses in the forefront of rose commerce, David Austin used Iceberg as the parent or grandparent in three of his most successful cultivars: the yellow shrub Graham Thomas (1983), the peach-colored bush Belle Story (1984), and the light pink Heritage (1985). Brilliant Pink Iceberg was a sport found by Lilia Weatherby in New Zealand. This remarkable plant has all of Iceberg’s good qualities with the addition of a hot pink flush, appearing on each petal. The effect is more like a hand painted bloom than a solid color variety. This sport finally gives Iceberg a little more charm as an individual rose bush. Other variations of Iceberg are now in commerce: Blushing Iceberg, Blushing Pink Iceberg, Burgundy Iceberg, Golden Iceberg, and Pink Iceberg.